Stránská skála, source of much of the chert used by the Bohunician culture in Moravia for their lithic industry. The core area for the IUP in Europe lies in Moravia and the Balkans. A group of major open-air sites and caves in these regions contain assemblages of stone artifacts that are very similar to those assigned to the IUP in the Levant and Central Asia. In the Balkans, specifically in Bulgaria, they include the caves of Bacho Kiro (Layer 11) and Temnata (Layer VI), and in Moravia (Czech Republic), they include the open-air sites of Brno-Bohunice and Stranska skala. Farther north, in southern Poland, is Dzierzyslaw 1.13 The industry is known locally as the Bohunician. 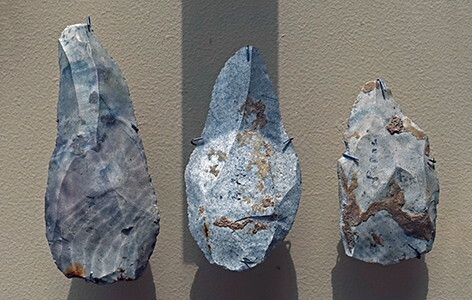 The stone tools often were produced from Levallois blade cores with hard-hammer percussion and include many forms considered typical of Upper Paleolithic industries associated with modern humans (that is, end scrapers and simple burins), as well as Levallois points and side scrapers. Some assemblages also contain bifacial leaf-shaped points (more common in the northern sites). As with the IUP in the Levant, non-stone artifacts are extremely rare. The presence of bifacial leaf-shaped points in the Bohunician may be highly significant because similar points are found in another group of sites in Hungary (known locally as the Szeletian) that appear to be of comparable age. Many are caves in the Bükk (Beech) Mountains that appear to have been occupied briefly - perhaps as short-term hunting camps. In addition to the points, the sites often contain typical Middle Paleolithic forms (for example, side scrapers). 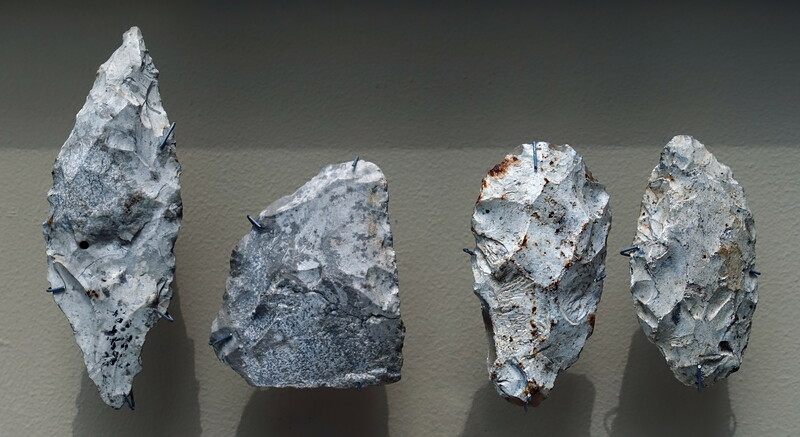 Rather than constituting a separate industry (and one often attributed to the Neanderthals), the Szeletian may simply represent a recurring set of artifacts made by the same people who made the Bohunician assemblages (a functional subset of the IUP) The IUP sites in central Europe date as early as the beginning of Gl 12 (about 48 000 years ago), and some are associated with a buried soil that apparently formed during this warm interval. Other assemblages significantly postdate Gl 12 and are associated with a younger soil that could have formed during Gl 11. The IUP may have endured for more than 5 000 years. 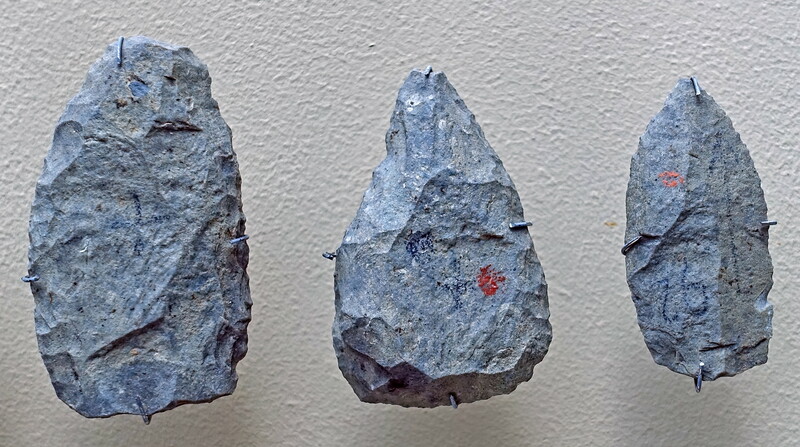 Stránská skála was a significant source of chert, which was the main lithic material used in Brno-Bohunice. The Bohunician ensembles lie in the Středowurm ("Bohunice") soil. 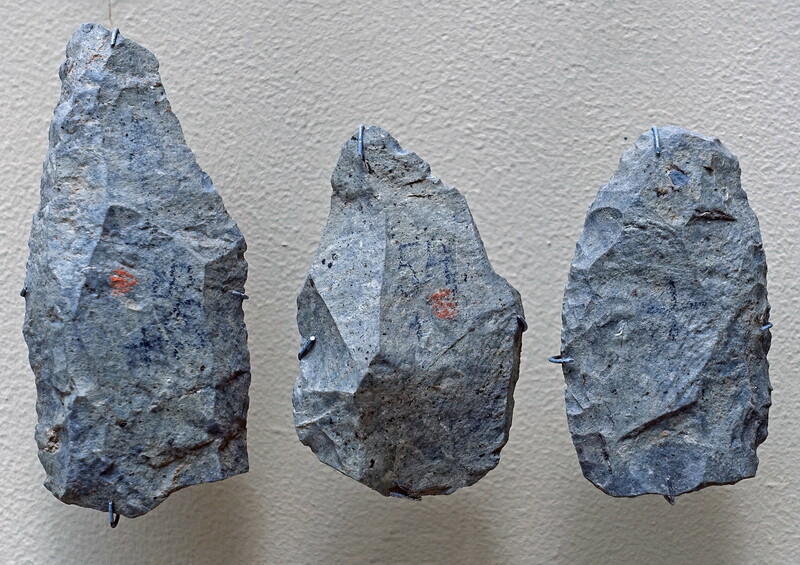 Its oldest units, about 40 000 years old, were formed by a soil-forming process from the Starowurm loess. With average annual temperatures rangingfrom -8 to -3C, the cold tundra fostered the development of the dwarf willow and other grazing resistant vegetation. Among the transition industries which include the Levallois technique as part of the mix, the Bohunician is the youngest. Over time, it seems to have merged with the parallel Szeletien, and the Aurignacian. Stránská skála is an isolated limestone hill, situated about 5 km north and east of the centre of Brno. It is 1500 m long, almost 400 m wide, and lies 310 m above sea level. While the southeastern slope is quite moderate, and passes gradually into a plain, the northwestern boundary is steep, the limestone walls falling vertically into the valley. 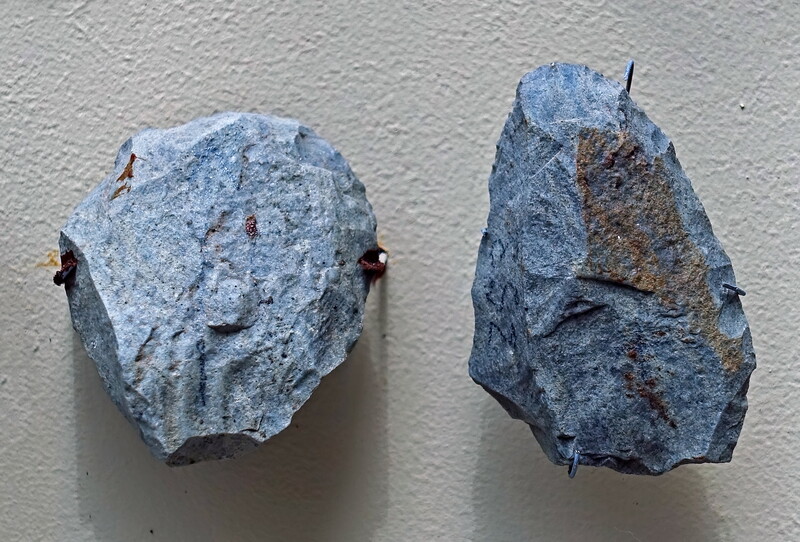 The two main tools in the culture were the point and the scraper, four examples of which are shown here, which were used mainly for scraping skins in the leather making process, and for smoothing wood for spear shafts and other wooden tools. These are described at the museum display as double sided worked points. 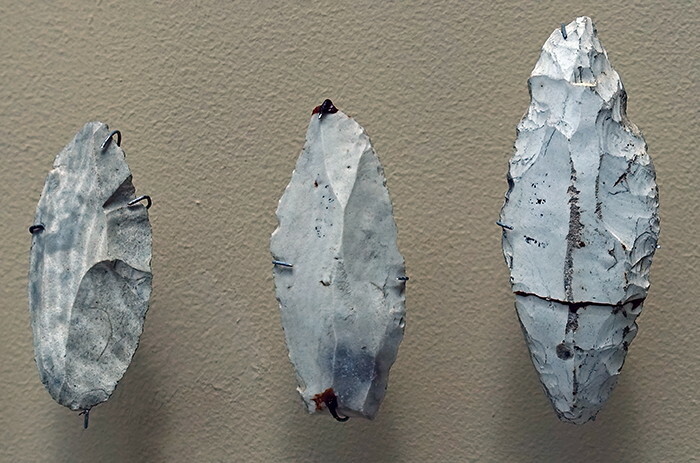 The leaf like shapes of the Sleztian type were always made of imported flint. In some Bohunician localities it is completely absent. 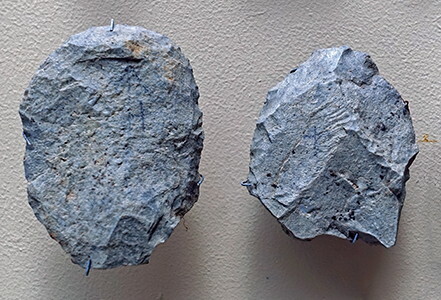 Levallois points from the Bohunician site near Podolí. Podolí lies 8 kilometres (5 mi) east of Brno. 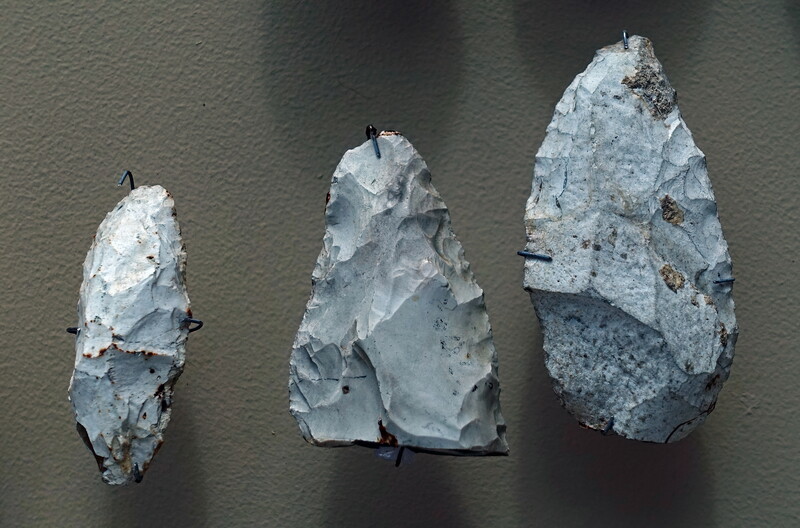 Sidescrapers (racloirs) and wedge shaped tools were mostly made from raw materials typical of the Szeletian. 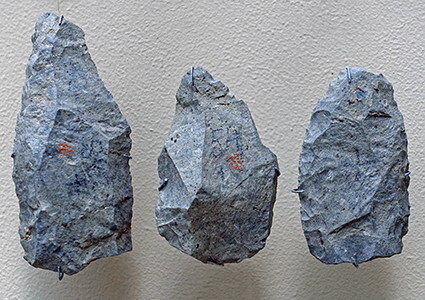 Points with a partial flat retouch (so called Jerusalem points) are common even in the lower layers, where they are produced from the local chert from Stránská skála. They demonstrate the influence of culture, acculturation. The effects of acculturation can be seen at multiple levels in both the original (native) and newly adopted (host) cultures.